Rural property activity in Northland was strong during the autumn, especially in the Kaipara area. Several sales of smaller farms, priced between $1.5 and $2 million, were concluded. On a larger scale, a 430 hectare Kerikeri dairy farm also sold notably in March for $8.4 million. With the sector turning around, some purchasers are first-time dairy farm owners, while others are consolidating or reconfiguring their holdings, focusing on one area, rather than having farms spread wide. Prices have ranged from $9,000 to $28,000 per hectare. Elsewhere, with meat schedules favourable and plenty of autumn grass, a few dairy farms have sold to intensively farm beef. 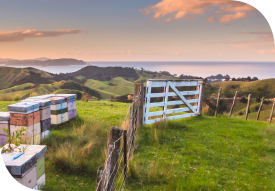 Heading into winter, the market is short of rural listings, particularly between Whangarei and Rodney. With plenty of unsatisfied demand, any Northland farms listed for winter or spring sale should attract enthusiastic scrutiny. With various of the region’s rural localities under pressure from urban growth, one of the features of the recent Waikato market has been increased diversity. Some farmers have purchased property with a view to alternative land use. Smaller farms are particularly attracting this interest. One 50 hectare dairy support property on the outskirts of Hamilton was purchased recently for conversion to arable. Around Matamata, land is coming out of dairy into onions and potatoes. Following further land use change, Waikato is also growing more kiwifruit than has historically been the case. Sheep and beef properties did not feature heavily in the region’s autumn market, although the value of those that have sold held steady. Meanwhile, dairy properties in the region’s more desirable localities continue to sell well on steadily appreciating values and in greater volume than was recorded in autumn 2016. Bay of Plenty kiwifruit orchard sales generally catch the eye. This autumn transactions were between $750,000 and $800,000 per canopy hectare for gold G3 land and $350,000 to $400,000 for Haywards green kiwifruit orchards. Dairy property sold well, including a 44 hectare Waihi farm that changed hands for $3.4 million (approaching $80,000 per hectare), purchased by a neighbour at auction. With positive indications around the dairy payout, Rotorua’s rural property market looks set for increased activity in spring. Rotorua autumn sales ranged from $25,000 to $45,000 per hectare, depending on the quality and location of the farm. Rotorua drystock blocks are in demand, whether for beef finishing or dairy run-off, and the most desirable finishing farms in the region have sold at up to $30,000 per hectare, although values between $15,000 and $20,000 per hectare are more commonplace. Whanganui and Taranaki’s autumn rural property market was less active than in recent years. While the dry summer cautioned many farmers against offering land for sale, the bulk of those farms that were listed sold well, particularly at the upper end of the market. Improving sheep and beef incomes drove farm sales, with Whanganui finishing and grazing blocks changing hands between $4,400 and $7,000 per hectare. A small handful of farms sold to reverse dairy conversions and property outside the region’s premier localities proved difficult to sell. Some of these may return to the market in the spring. Taranaki dairy farms sold within a wide range of prices from $27,000 to $60,000 per hectare, depending on location and the quality of improvements. Well-located properties with good production history and a high standard of improvements continue to attract significant demand. Although demand for all types of rural property remains strong in Manawatu and Wairarapa, few farms were listed for sale in the region during autumn. Sales in the region indicate year-on-year capital gain of up to five per cent. A notable Manawatu sale in April was a 659 hectare Halcombe finishing property that sold by tender for $7.56 million (or over $11,400 per hectare). Wairarapa dairy farms that sold during the period ranged in price from $22,000 to $30,000 per hectare. Meanwhile, a marked increase in income from traditional sheep and beef breeding properties led to sale prices for Wairarapa farms in that category firming between $4,000 and $4,800 per hectare. With listings scarce and unlikely to increase, a continuation of the prevailing sellers’ market is indicated through winter and into spring. A limited number of Hawke’s Bay farms were offered to the market in autumn. These sold well. Although market activity is likely to slow through winter, as it traditionally does, prospective vendors are considering marketing property in spring and are preparing accordingly, well in advance. Autumn was late this year. However, when it did arrive, it brought plenty of grass and was accompanied by excellent cattle prices and an overall increase in-store sheep and cattle prices, which is encouraging for farmers and lifted the rural property market. Farm values in the region remain strong, with listings selling quickly at good levels. Several larger Hawke’s Bay properties sold at prices between $7,000 and $10,000 per hectare. While demand for farms is likely to drop away heading into winter, with few available for sale, this should change again in spring.